Easy run with Ted in the morning. Tapering, so only 8 miles. Ran one tempo mile. Ted set the pace. He did not look at the watch, and I did not tell him the splits. I was surprised at how hard he pushed it. Then after we finished I asked him how fast he thought it was. He said it was slow, about 5:38. I enjoyed watching his amazement as I announced that our actual time was 5:17. This is his record since he returned from Iraq. Our quarter splits were 1:19, 1:18.5, 1:19.5, 1:20. I could feel a big difference between 1:19 and 1:20. 1:20 was a lot easier. This is a very good sign. It means my threshold is very close to 5:20. If a certain pace is way faster than your threshold, slowing down by 5 seconds per mile still keeps it in the zone of pain. If it is way slower than your threshold, slowing down by 5 seconds per mile still keeps it the zone of comfort. But when you get right to it, within no more than 5 seconds per mile, that is when slowing down by very little makes a huge difference in perceived effort. HR got up to 160 at the end of the mile. Another good sign - after 0.5 of brisk jogging it went back down to 121. This is another indicator that the effort was to a large extent aerobic. When it is more severely anaerobic, HR hovers at 130 for a few miles unless I slow down to 9:00 pace. I noticed that we were 30 seconds behind the 7:00 mile guy with 0.5 to go, and initiated the chase. We got him. Clocked the last 0.25 - 1:26. The first one by the GPS was 1:23, but I am not 100% sure it was accurate. I did feel that we eased off a bit on the second one, though, so it could have been right after all. Total time was 55:48. Ran with the kids in the evening. Benjamin surprised me with a powerful surge on the last quarter. I looked at him and thought that if his legs were a bit longer I'd be in serious trouble, especially pushing a double stroller. He hit the last quarter in 1:39. Last Saturday the Fast Running Bloggers had quite a sweep in various road races. Steve Ashbaker, Ruth, Cody, Bill Cobler, Breanna, Dave Holt, and myself won. John Kissane, Cheston, and James Barnes took second. Bill Campbell (the Wild Bull) and Chris Rogers took third. So that is 7 first places, 3 seconds, and 2 thirds - 12 top three finishes overall in just one day. Add to that Ryan Woods who ran 1500 meters taking 10th in a very competitive meet with the time of 3:47 - something that would have won with a large gap in almost any other race. We are starting to show some muscle. Keep up the good work, guys! Final speed workout before Ogden. 3 mile tempo run from Geneva Road on the way to the Utah Lake, then 180 at 1.5 and back. Slight down the first mile, mildly almost invisibly rolling (I think you'd see it better if it were not for the trees) everywhere, slight up on the last mile. Ted ran the first mile with me, we started out slow - first 600 in 2:06 even paced, but then picked it up to a steady 5:20 pace. Hit the first mile in 5:26, HR at 152. The pace felt comfortable. Without Ted the second mile felt harder. I could tell I slowed down a bit, but at the same time, it felt harder. Next two quarters 1:21, 1:21, 8:08 at the turnaround. Recovered from 180 turn in 1:24 (43,41), then got back into the groove, next quarter in 1:22, 10:54 at 2 miles, HR at 159. Ted gave himself a bit of a head start, but nothing I could not close quickly with a surge. I saw 100 in 19 seconds, and knew he was going to stir some trouble. So I tucked in behind him and hung on for dear life. The head started getting a little fuzzy, but the pace still felt sustainable, HR hit 165. Checked the split at the quarter, wow, 1:17 uphill. The bad news was that it hurt. The good news was that it was fast. Ted eased off a bit on the next quarter, 1:20. Next one in 1:21, and then the last one in 1:20. 16:12.2 for the run, 5:18 last mile. Actually it was probably 5:17.6, because Ted got 5:18.7, and he started a bit ahead, and finished a bit behind. Not bad, equivalent of 5:07 perfectly flat. HR got up to 168. The last mile was very painful. Ted said he's never heard me breathe that hard. This is a good sign, it means I am getting into shape. I ran this tempo run alone in 16:22 a couple of weeks before Richmond in 2003. As far as I remember, I went out at 5:20 pace, but then could not hold it in that tempo, and was down to 5:35 on the last mile. In Richmond, I was doing qualify or bust. So I hit the first half in 1:12:09, maintained 5:30 pace to 15, then it was bust, but not too bad - finished in 2:31:45. Good sign - HR was down to 124 after a mile of jogging, and then stayed there at sub-8:00 pace. This is an indication that although that tempo hurt, it was primarily an aerobic effort. Ran with the kids in the evening. Let Benjamin take off on the last quarter and watched him from a distance. He was running 7:30 pace, he told me afterwards it felt comfortably hard, but his form looked like he was jogging. This is a very good development, to feel the pain of the hard pace, but still look relaxed. Really tapering today. Ran easy 4.5 with Ted in the morning. Did a tempo mile. Was trying to do a very honest marathon pace. Did 1:25 - 1:24 - 1:23 - 1:22, 5:34 for the first mile of the standard 5 mile tempo. HR maxed out at 146. The pace felt very relaxed, like if I were racing today and was running alone, that is how fast I would have been starting out. Same run as yesterday with Ted in the morning. Ran the same tempo mile. A bit more cautious today, did it in 5:40 with the quarters of 1:25, 1:25, 1:24, and 1:26. HR maxed out at 146, but got there a lot faster. The effort felt harder in a way, but that does not worry me. Ran with the kids in the evening. Benjamin ran in the Hershey Track Meet. There was a strong headwind that made his 100 m slow - 20.82. Then about a couple of minutes later he demolished his almost year old 400 meter PR running 1:32.44. He also threw a softball 46.8 feet, or about 14 meters. This does not tell me much, though. Can anybody tell me how throwing a softball compares to throwing a tennis ball? Ted's son James ran 800 in 2:39, and then 400 in 72 winning both events. Danielle Menlove was there, and thoroughly embarrassed the boys in both 800 (2:29) and 1600 (5:23). Interestingly enough, her 1600 meter PR is 4:54, she's run 1500 in 4:34 and won the Nationals in her age division. She is 13 years old. I remember how two years ago she won the Salt Lake Classic 5 K overall passing Michelle Simonaitis on the last mile. We do not need to go to Kenya to find some running talent. Easy run with Ted in the morning. Ran a tempo mile in 5:36.7. HR got up to 147. Ran with the kids to pick up VanGoGo from Computune. We had to replace the fuel injection system computer and things that go with it. Drove to Ogden with Ted in the evening. We stayed with my friend Nate and his family in Farmington. 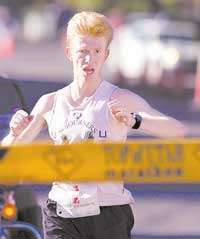 Brief report on the Ogden Marathon, more to follow later. 2:32:00, 6th place. Ahead of me: Paul Petersen (2:26:24), Steve Ashbaker (2:29:31), Joe Wilson (2:29:33), Neal Gassman (2:30:05), and Mike Dudley (2:30:51). What a race, especially considering the hot conditions on the second half! First half 1:14:36, second half 1:17:24. Last 10 K in 37:16, pleased with that considering the weather. Special congratulations to Paul and Steve on running PR's in spite of the course and weather challenges. Now incremental full report, will do it in parts as I have time. Steve and I had a plan to run together for the first 15 and then make it race from there. It worked out quite well. After the first two warm-up miles in 5:42 and 5:40 we settled into a nice 5:30-5:35 pace and it felt just right. Paul went ahead as we anticipated, while Neal ,Joe, and Mike Dudley hung back. For those who do not know, Mike Dudley is a 2:14 marathoner that is currently somewhat out of shape. I am not sure why he decided to run Ogden, but he was there. At first I did not know who he was, but then the suspect revealed his identity upon questioning around mile 17. We went through 5 miles in 27:56 (I am giving splits by the official mile markers, they were where they were supposed to me). Maintained good pace through 8, then slowed down on the rolling hills. 10 miles in 56:14. Next mile in 5:59. That was probably too much, but I wanted to make sure the pace felt relaxed. It was probably getting a bit warmer too, so the same effort now was not giving the same results. Mike Dudley caught us, and all three of us started working together. We sped up to 5:48, and then ran the steady uphill mile in 5:58. Hit the half in 1:14:36. Steve started feeling a bit edgy, like he wanted to make a move. I told him to hold back until we were over the hill. I now started thinking race the second half, forget about the first. The first mile of the second half was 5:44. Missed the second one. We were moving along at about 5:50 pace after the hill. At the dam (17 miles), Steve made a move. Mike responded but fell back. I passed Mike, then he passed me back. I started feeling the effects of heat, and was not feeling energized. From that point I was just trying to keep my head above water (sub-6:00 pace). Joe and Neal went by at around 19 miles. They were going strong. I got to 20 miles in 1:54:44. From that point I was trying to maintain a positive attitude. I was not unhappy about being on pace for 2:32 realizing that the heat was taking its toll. However, seeing the prize money run past me and not feeling the strength to chase it was discouraging. I decided to plod along and be ready to pick up roadkill if there was going to be any. It did not look like there was going to be, and there was not. I managed to stay sub-6 until mile 25, which is flat, even a bit rolling, and has a lot of tunnels on the trail. I did it in 6:08. When I got out on the home stretch, I decided it was finally safe to just go for it and give it all I had. I started seeing the quarter splits of 1:30. Saw 2:30:45 at 26 miles. Did the math, figured I needed 1:15 for 385 yards to get 2:32:00. Sprinted as hard as I could and pulled it off. This is incidentally a PR for the last 385 yards of a marathon as far as I recall, or at least one of the fastest times. I promised myself that I would go and find Dan on the course afterwards if I were feeling half-decent. I knew that out of everybody in the blog group Dan would be struggling the most in the last miles. I jogged a bit, the back was stiff. Stopped and talked with Scott Browning (The Siren) and Bob Hintze. Saw Ted finish, then started jogging again. Felt better this time. After a while felt confident in my ability to pace others in the 2:50 - 3:00 and change bracket. Saw Cody, he looked like he could use some help. He was doing better than I thought, he told me to run faster. He made me run a quarter in 1:34, I count that as marathon race pace in the miles. Sent him off to finish the kick, and went back to find Dan. Found him sooner than the worst I was expecting, actually closer to the upper range. He should have been sub-3 or close based on his training and racing, but it was hot and it kept getting hotter. He ended up doing great for the conditions - 3:05:03, 7 minute PR, and Boston Qualifier. Ran with Julia in the afternoon. Benjamin and Jenny ran with Sarah and Adrianne tonight. The recovery is going well so far - legs are not sore, although a bit cramped from the heat. The biggest damage was in the big left toe, same as after 30 K.